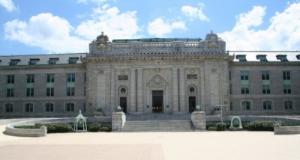 Bancroft Hall is located at the U.S. Naval Academy in Annapolis, Maryland. The incredible building is the largest single dormitory in the world and can house 4,000 midshipmen. Every year the midshipmen of the Naval Academy go on their summer cruise. 77 days later the new plebes arrive to start their training. During this short window the huge Bancroft Hall is available for repairs and renovations. This year Encore served as the Historical Preservation Quality Control Specialist (HPQCS) to the Contractor for the restoration services in the Rotunda and Memorial Hall of Bancroft Hall. The restoration work involved repairing cracked limestone and plaster, replacing stone floors in the vestibules, cleaning the 40-foot tall chandeliers and repainting large portions of the ceiling. A the HPQCS Encore worked with the general constructor to ensure that he historic materials and colors were accurately replaced or patched in kind. A structural analysis of the cracking patterns by Baker Ingram concluded the cracks were likely the result of the 2011 earthquake. A paint analysis by Matthew Mosca revealed the sequence of the ceiling paints and colors throughout the history of the building. 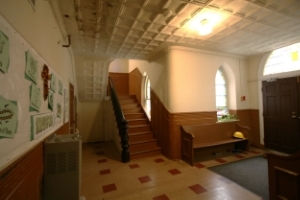 The renovation refreshed the building during the 77 day window and maintained its historic character. The report on the building finishes completed by Encore will inform future work in these important historic areas of the Academy. Encore is the architect for the restoration of the Asbury United Methodist Church in Easton, MD. The Church was recently the recipient of the African American Heritage Preservation Grant Funds from Maryland. The leaning bell tower, broken stained glass windows, rotten wood trim, and steps too high for elderly members to use will all be fixed. The first phase of the project will focus on the exterior restoration work, including the repointing of the two story brick structure and steeple tower, installation of cedar shake shingles to replace the current asphalt singles, restoration of the wood belfry steeple tower including the 1893 Henry McShane Bell, restoration of the original wood trim and cornice, replacing the main entrance doors to match the originals, and restoration of the exterior monumental church sign. A new ADA compliant ramp will also be added to the rear of the structure to provide an accessible entrance to the first floor. The Church is rich in cultural history. Asbury was organized in 1836 as both a white and black congregation. By the late 1840’s there was a movement to separate black and white members and in 1844 there was a plat deeded for the colored church. The first house of worship was a wood frame structure used until the present brick structure was constructed in 1876. Asbury has served the community in various ways; as a temporary high school classroom for the African American students in the 1930’s and now as a community center for the historically black enclave know as “The Hill” which is located within the Easton National Register District. The property’s historical and cultural significance, specifically its importance to the African American experience, has led it to be designated as site #33 on Maryland’s Underground Railroad and Network to Freedom Sites and Stories. In addition to its cultural significance Asbury also has significant architectural value as it is the oldest African American church structure in the 300 year old Town of Easton and the second oldest African American church structure in Talbot County. 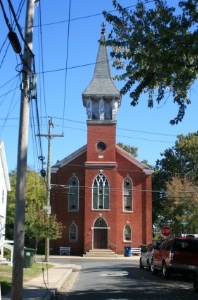 The building is a gothic revival, two-story, forward centered steeple, brick church structure. This rectangular structure has an architecturally significant bell tower with a lattice belfry and a pyramidal roof with flaring eaves. The bell tower features a Henry McShane Bell produced in 1897 (the Henry McShane Bell Foundry is one of seven bell foundries still producing bells in the country). To read more about this exciting restoration, check out this article from the Star Democrat!